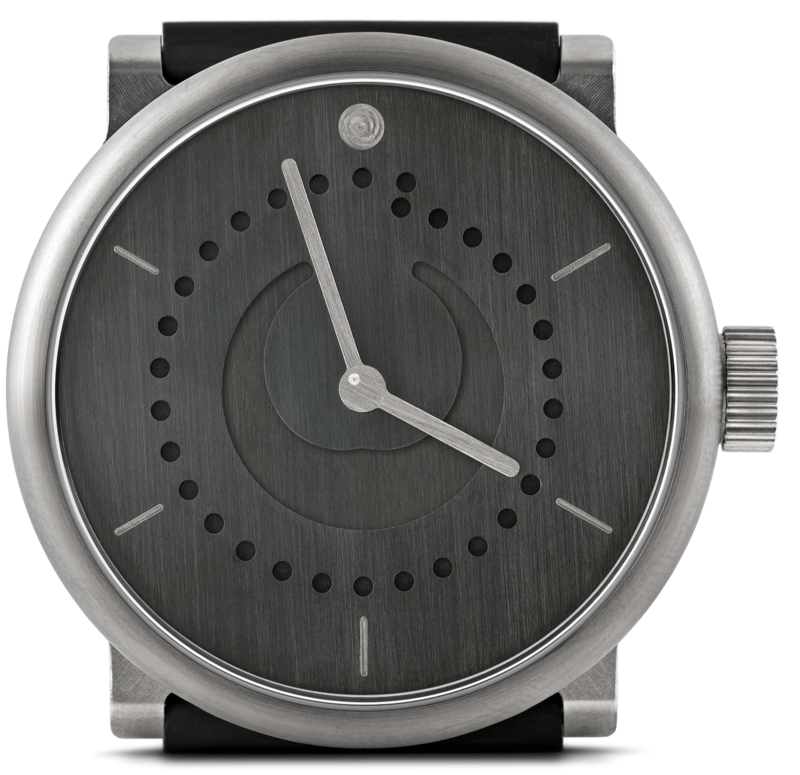 Ludwig Oechslin’s moon phase watch displays the moon phase, date, and time. It features a unique moon phase function executed as a 5 part epicyclic gear system that will take 3,478.27 years before its calculation will be off by 1 day. The analogue date display is more readable than a digital display from the same distance, and unlike large digital displays, is not a distraction when checking the time. ochs und junior manufactures about 50 moon phase watches per year. 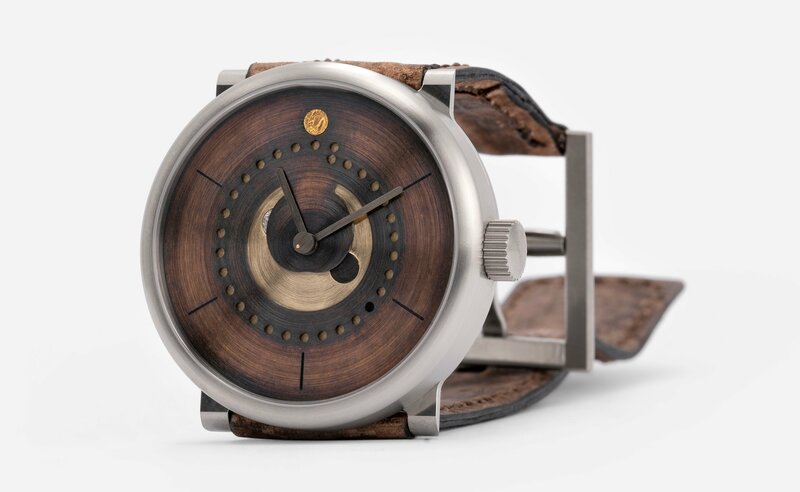 Each watch is sold directly by cofounder Beat Weinmann from the ochs und junior workshop in Lucerne. You can select your moon phase watch from models designed by ochs und junior in our online store. Or you can design your moon phase watch using our online customizer. With pleasure, Weinmann will guide you to your perfect moon phase watch on the phone, over email, or in person. The arrows next to the watch above allow you to show different phases of the moon. The center represents earth and the large dot at 12 o’clock represents the sun. Full moon is when the moon is opposite the sun and earth at 6 o’clock. New moon is when the moon is hidden between the sun and earth at 12 o’clock. The new moon is represented by a dark circle at 6 o’clock. The 30+1 holes around the perimeter of the dial display the date. The 10 minute markers serve as reference points. For example: the marker indicating 30 minutes also shows the 15th day of the month (30÷2=15). These 5 day markers allow for the date to be read at a glance and after a short time, you can recognize the date intuitively. This video of Ludwig Oechslin explaining the date spiral for his perpetual calendar is also relevant for his moon phase watch. How is Oechslin’s moon phase function implemented? An epicyclic gear train driven by a central finger bonded directly to the hour pipe turns the lunar disk beneath the dial counter-clockwise. 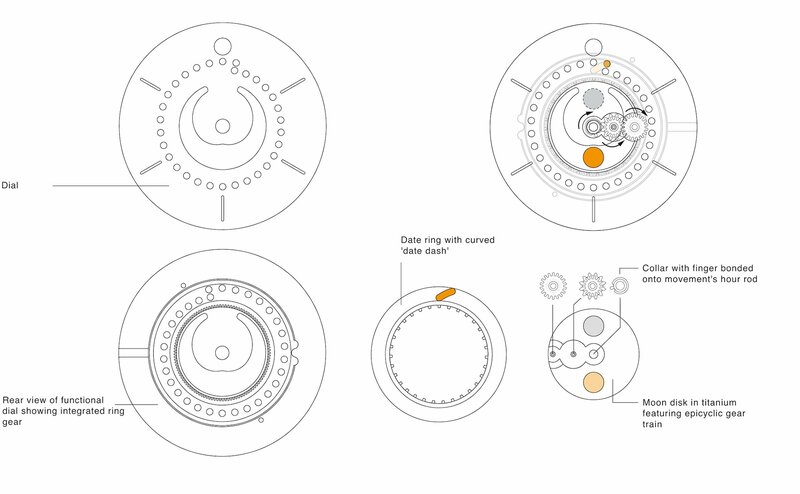 The central finger engages with a wheel bearing 12 teeth, whose pinion with 14 teeth meshes with a wheel bearing 18 teeth, whose pinion with 14 teeth meshes with the fixed recessed ring gear with its 109 teeth machined into the underside of the dial (annotated diagram). What is the benefit of a highly precise moon phase calculation? The average time between two identical moon phases is 29.530589 days. Most moon phase watches approximate a lunation as 29.5 days, which leads their calculation to be off by 1 day after 2 years. The closer your moon phase calculation comes to the average lunation of 29.530589 days, the “flatter” the difference between your prediction and the actual moon phase. The ochs und junior moon phase calculates the lunation as 29.5306122449 days. As a result, it will predict the moon phase correctly for 3,478.27 years before it is off by 1 day. This means that you only have to set your moon phase one time, and you can trust that its prediction is precise. Watches and astronomy by Ludwig Oechslin. 5-part epicyclic gear system designed by Ludwig Oechslin. The calculation is precise for 3,478.27 years before it is off by one day. Manufacturer: Peter Cantieni / Hinwil / Switzerland. 30+1 hole date spiral with 5 minute markers that serve as reference points designed by Ludwig Oechslin. The ochs und junior moon phase watch is entirely manufactured in Switzerland. 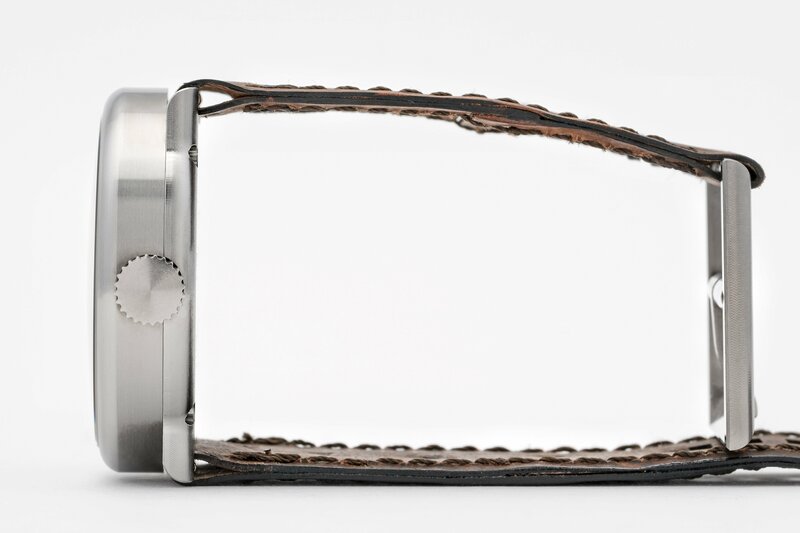 The case, gear system, dial, buckle, and hands are individually-manufactured by Peter Cantieni in Hinwil, Switzerland. Each watch is hand-assembled and regulated at the ochs und junior workshop in Lucerne. 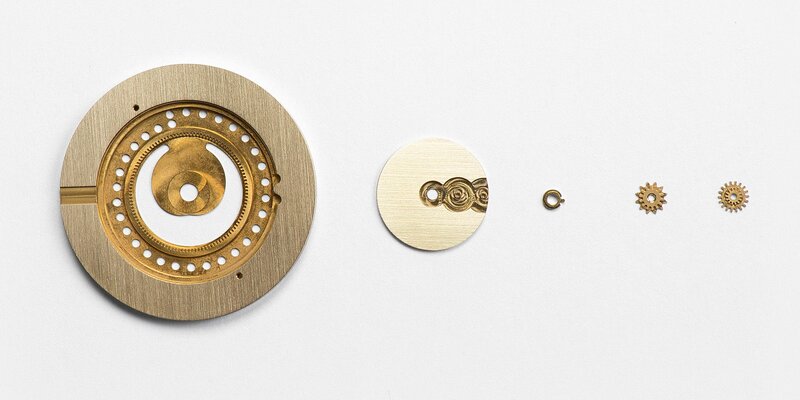 A lifetime warranty covers all parts invented by Ludwig Oechslin, and the entire watch is covered by a 2 year guarantee. ochs und junior’s small scale and direct sales model allow it to offer uniquely fast and competent service. 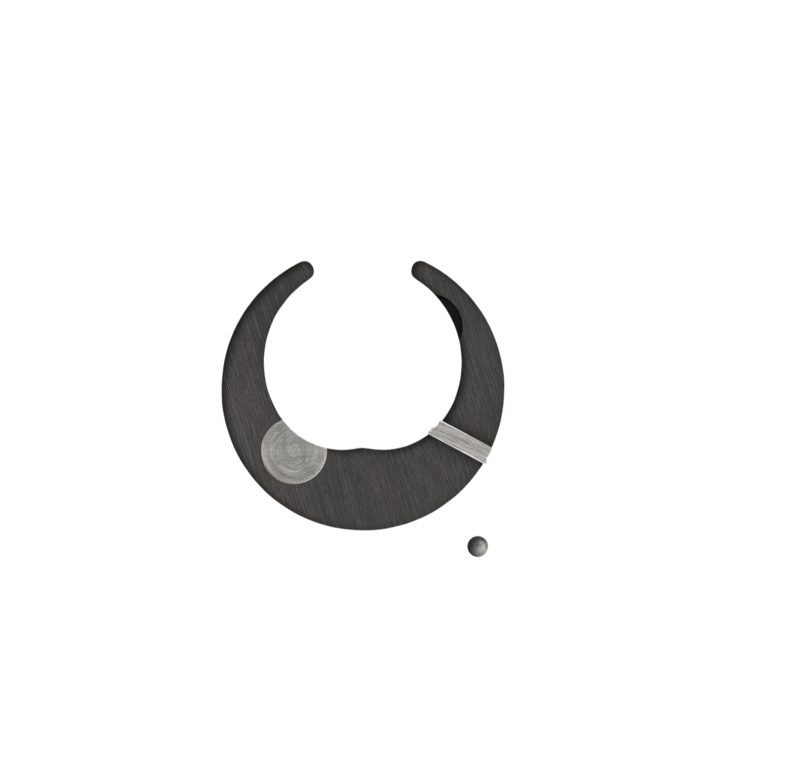 Watches in the moon phase store are designed by ochs und junior. Individually manufactured, they have the potential to become classics.